16 million years ago, the earth was a very different place. In continents now disappeared, in the midst of several aquatic species that no longer exist, in a solitary world, without noise and without movement, the first plants were born little by little, the seeds clung to the soil and formed forests visited by some amphibians and Arthropods activity in the sea and on earth began to make the world vibrate. However, hundreds of years later, a great extinction ended with an era and with almost 83% of the species that populated the planet at that time life at sea disappeared to a great extent; life on earth, for its part, strengthened and continued to evolve. Properties and characteristics of a trunk. It is possible to calculate the age of the trees from the rings on their trunks when making a longitudinal cut. each ring indicates a year: thin rings mean difficult years, while thick rings mean years with more water abundance. Medulla: In botany, the marrow is the soft tissue that constitutes the interior of some stems and talus. Heartwood: The heartwood is composed of biologically dead cells whose sole function is to provide the trunk of the tree with a strong and resistant internal structure with which to support the entire weight of the branches and the cup in general. Sapwood : Sapwood can be considered as the "living wood" of a tree, as it is a biologically active tissue whose primary function is the water conduction from the roots to the foliage. Cambium: In Botany, the cambium is a specific meristematic plant tissue of woody plants, located between the bark and the wood, usually composed of a single layer of embryonic cells. Liber: It is the one that transports the nutrivities elavoraqdos by photosynthesis. Bark: The bark or ritidoma is the outermost layer of stems and roots of woody plants, like trees. 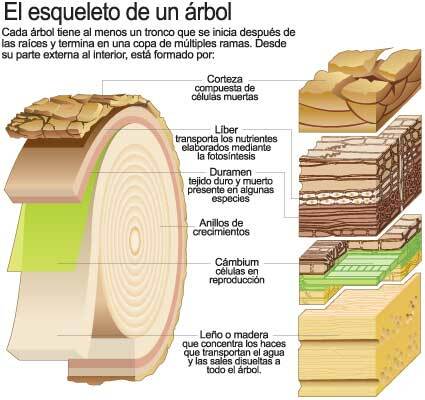 It covers and protects the wood and consists of three layers, the felogen, the phloem, and the vascular cambium. It can reach about 10-15% of the total weight of the tree.